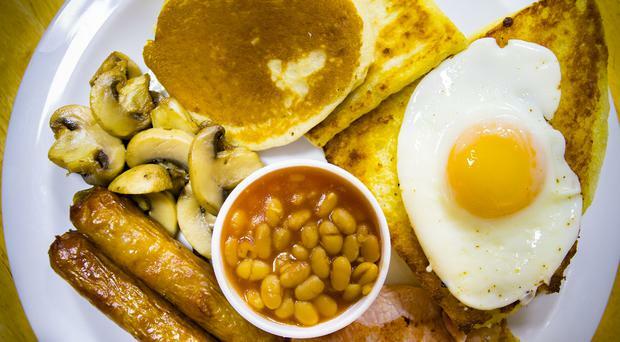 The cost of an Ulster fry is rising despite many of its ingredients dropping in price, new figures show. The biggest decrease was in the price of bacon, which is down 5.1%. The figures emerged in the latest Ulster Fry Index, produced by Ulster Bank and compiled using data from the Office for National Statistics (ONS). It said tea was down 3.9% while eggs were down 2.5%. However, the price of sausages rose by 1.6%, and tomatoes were 1.4% more expensive. The overall index had risen by 0.9% over the last year - the lowest rate of inflation since 2016. Consumers would be warned to steer clear of butter and spreads to avail of a lower-priced fry - margarine was up nearly 22% and butter by close to 7%. Taking away the spreads and eating dry toast (if you have room for it after scoffing fried soda farl and potato bread) with your fry instead, leads to an overall fall of 0.8%. Ulster Bank chief economist Richard Ramsey also warned that any trade disruption after Brexit could affect the price of much food, including items like avocados imported from South and Central America. While an unlikely addition to an Ulster fry, avocados are now a must-have breakfast food for many, including fans of cafe favourite smashed avocado on toast. And the fall in the cost of rashers could also prove shortlived, as prices are expected to shoot up as a result of an outbreak of African swine fever in China. The outbreak means that Chinese consumers are now looking to European markets to satisfy their bacon and pork cravings, resulting in an increase in prices since the period covered in the Ulster Fry Index. Mr Ramsey, who compiles the index every year in the run-up to the Balmoral Show, which is sponsored by Ulster Bank, said the index's prices could fluctuate in future. "With a disorderly Brexit or a hard Brexit, the more likely it is that we will see food prices rise as a result of tariffs and trade disruption," he said. Mr Ramsey added that the emergence of swine flu in China "highlights how prone to weather and health-related shocks the agri industry is". He said the Ulster Fry Index was a playful way of helping consumers understand rising food prices. "Food makes up a significant proportion of household spending," he added. "Food and drink is also a key sector of the Northern Ireland economy. "So, understanding how the price of food items is changing gives us some insight into both the current state of consumer finances, and also some of the challenges facing the agri-food industry. "There are a wide range of alternative indices around the world - from the Big Mac Index to the Cappuccino Index - which are intended to explain economic terms in a straightforward way and to shed new light on important economic issues. "Ours is the Ulster Fry Index, and it hopefully gives the man or woman on the street a clearer idea of why their household finances currently are the way they are." Meanwhile, Ben Charles of Beacon, a food procurement firm in York, said African swine fever had put pressure on the market. He said the increase in demand facing suppliers in Europe made price increases likely over the rest of the year.